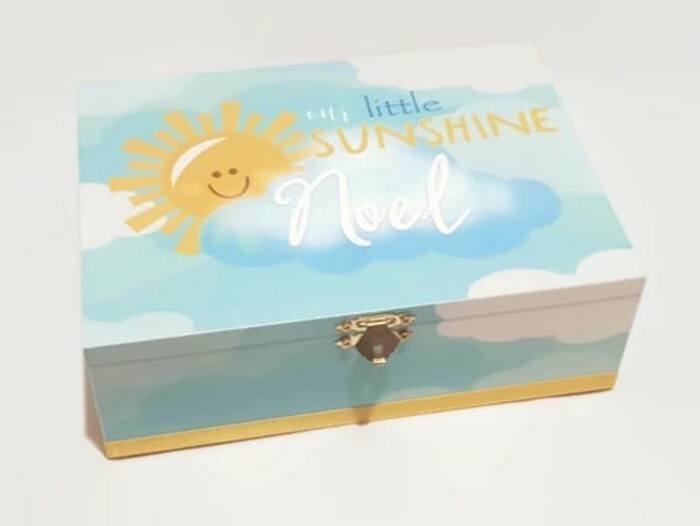 This keepsake box can fast become a treasured item. Perfect for holding their new born keepsakes, jewellery, hair clips/ties, special mementos or other collectibles. 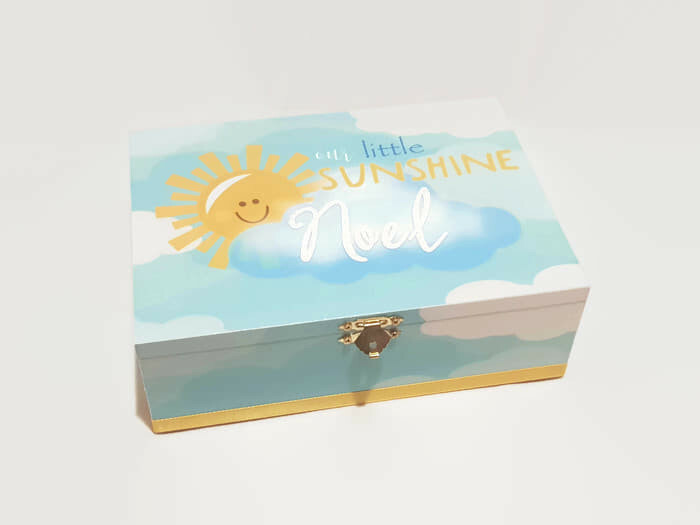 This keepsake box is perfect for any child (young or old) with it's "Our Little Sunshine" sunny theme. Made from mdf and hand painted in a high quality deep yellow acrylic spray paint (no brush strokes). Decorated with sunshine and cloud theme paper in white, yellow and blue/aqua. Lovingly adorned with name. Sun rays and sunshine word has a shimmer effect. A rectangle box with hinges. Please note that dimensions are approximate and may vary by a few mm. This keepsake box is hinged. Please note that keepsakes boxes are a semi fragile item and over use may cause wear and tear. Dropping or mishandling may break the box or dislodge embellishments. Primarily they are designed as a decoration. Please keep out of reach of young children as small parts may become loose if handled incorrectly and pose a choking hazard. Please allow 1 to 2 weeks for the item to be made (not including postage time). I endeavour to complete and post with in 1 week but sometimes this is not possible. If you require the item sooner, please contact me and I will make every effort to meet your deadline.